This episode offers tremendous insight into the issue of priority, the centrality of timing, and the importance of thorough documentation when advancing a new idea. Matthew’s concept of natural selection, like that of James Hutton in 1794, was buried in a longer work on other topics. 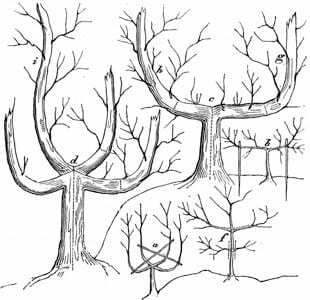 It appeared well before the broader community of natural historians was prepared to integrate such an idea into its thinking about the sources of biodiversity. And importantly, this brief essay lacked the extraordinary documentation and reasoning that Darwin brought to bear on the topic of natural selection when he finally marshaled his vast intellectual resources to write On the Origin of Species more than twenty years after first coming up with the idea of natural selection. For an excellent treatment of Matthew and his ideas on natural selection, please read: Wells, K. D. 1973. 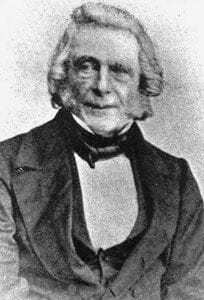 The historical context of natural selection: the case of Patrick Matthew. Journal of the History of Biology 6: 225 – 258. Plate from Naval Timber and Arboriculture by Patrick Matthew. Click here to read this book. The appendix on natural selection (Note B) appears on pages 364 – 369. 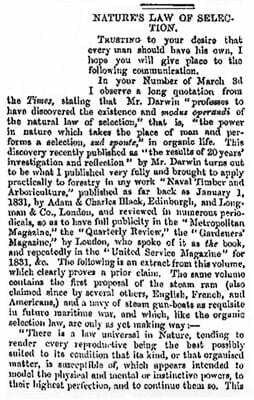 Beginning of the letter in Gardeners’ Chronicle in which Matthew asserted his priority over Darwin with respect to the discovery of natural selection.